Did you know women represent 87.1 million of the total U.S. adult online population (163.8 million) in 2010? According to the BlogHer-iVillage 2010 Social Media Matters Study, co-sponsored by Ketchum and the Nielsen Company, there are 67.5 million women (18 to 76 years old) out of 126.9 million social media users in the U.S. Now that's digital sisterhood! May all women know their investment in themselves and each other will yield a high return! Please visit Ananda's website and learn how you can get involve in 'Digital Sisterhood Month'. Thanks so much for the Sistalove Support. 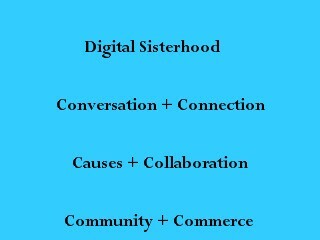 Happy Digital Sisterhood Month.